Professor Emeritus Robert Wilce on going the distance for arctic seaweed. Professor Wilce (right) dives with a graduate student in 1967. I saw more potential with living algae than I did with fossilized plants. And it worked—it’s taken me all over the world. 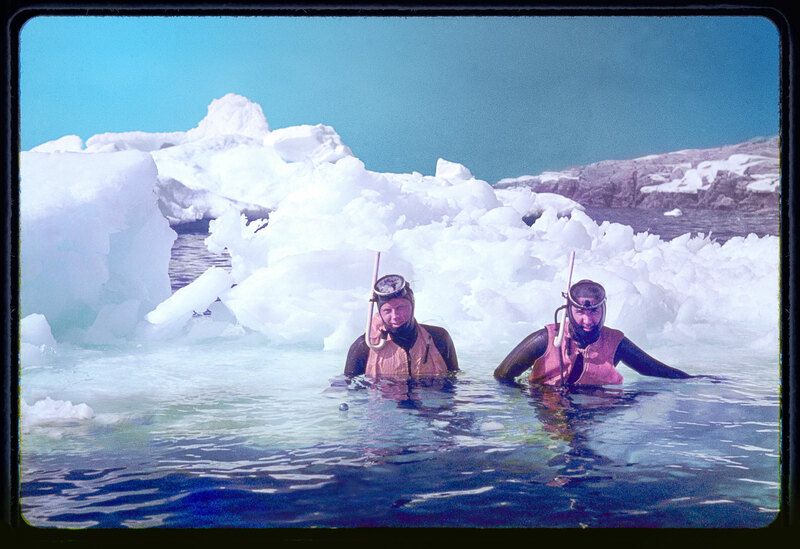 To acquire his specimens, Wilce dived through seal holes, traveled across miles of ice by dogsled, and once spent eight days in an open boat crossing ice-covered Ungava Bay in far northeastern Canada. He brought his specimens back to Amherst packed in the same Sherwin-Williams paint cans he used to transport out his food. Wilce made his last grant-funded expedition in 1994. At 92 years old, Wilce maintains a cluttered office in Clark Hall as a professor emeritus and still publishes papers. His latest, “The Arctic Stamp,” delineates the unique traits of the Arctic marine flora that he knows like no other scientist. His next project has him so enthused that he barged into the UMass magazine office to announce it—“I’ve got a paper that’s really hot!”—beaming over debunking a genetic hypothesis about a species he discovered in northern Greenland in 1961. “I’ve got fabulous data,” he said glowingly. At the time, the definitive book on the subject, The Algae of the Arctic Sea, published in 1883, was actually written about algae in northern Norway—sub-Arctic. This left a wide-open field for the intrepid Wilce. “The Arctic was unknown,” he says. Breathtaking stories befit a critical topic. Algae are the center of the high Arctic food web, making up 90 percent of the region’s food source. Yet the dozen species endemic to the polar regions receive light sufficient to perform photosynthesis for only two months of the year. “Their photosynthetic protocol is the same” as other algal species, explains Wilce, but, like their deepwater counterparts, “they do more with less light.” Arctic algae’s distinct biomarkers make them a good indicator of climate change—species shift, seawater warming, and sea-ice loss. Wilce is making a gift to the university of his herbarium—his personal collection of specimens. “I’m of a generation that works with whole plants. Specimens are the foundation of everything I write about.” His collection is a record of a geological epoch and of species that in the near future could be shifted out of existence. “There’s nothing like it in the world; there’s not another collection like mine,” he says—each one gathered by hand, each one with a story behind it.